Keith Bergman started telling jokes eight years ago, after spending enough time in rock bands to realize he loved the road and hated tearing down drum kits. Equally at home in A-list comedy clubs and dive bars, he tours the country telling stories of mortality, poverty, fatherhood, home fries and getting old in a world gone weird. He's released two albums, been on the Limestone and Whiskey Bear comedy festivals, his comedy has been featured on Funny Or Die and CollegeHumor.com, and he's opened for the likes of Tom Papa, Fortune Feimster, Joe List, Sara Schaefer, The Amazing Johnathan and Guy Branum. He owns maybe four t-shirts without death metal logos on them. 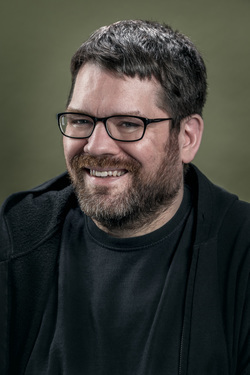 In a previous life, Keith was a freelance writer for blabbermouth.net, Metal Maniacs, and a number of other publications, in addition to co-founding satirical heavy metal webzine Infernal Combustion. He is currently finishing a novel, 'Sleep Tight,' which he will be shopping for publication, and is planning to self-publish a collection of short stories in 2019.